The If You Died Guide is the ultimate one life/one record resource. It summarizes in one written document, or electronically on your computer, all of the important matters of your daily life - household, legal, and financial. Providing key information in their time of need, the Guide enables your spouse, partner or children to experience a much smoother, less stressful transition as they strive to manage your affairs and honor your wishes. Available in fillable PDF format, electronic flash drive, printed notebook - or any combination of the three, with free shipping for everything - the If You Died Guide brings fill-in-the-blank convenience to the challenging task of organizing your life's most critical information and records. What's more, while you're still living, you'll find it to be of immediate benefit as an extremely useful all-in-one reference for you and family. Comprehensive in scope. Flexible to fit the life you live. 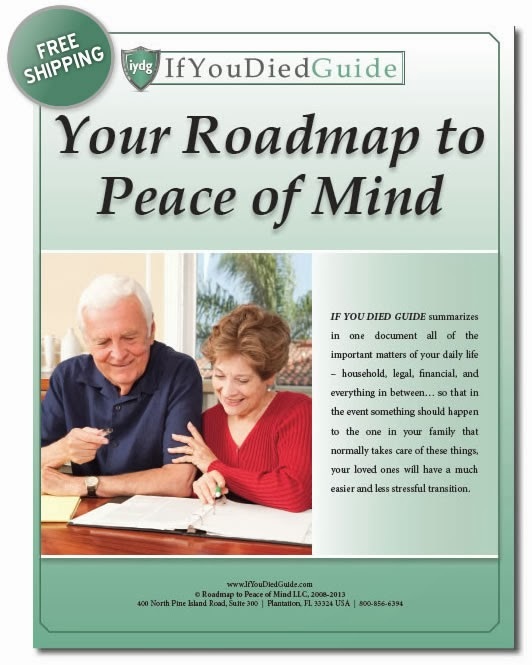 Let the If You Died Guide create a practical, peace-of-mind roadmap for you and your family. No matter what the future holds. If you died tomorrow, or became unable to manage your affairs, would your family know how to pick up the pieces you left behind? More than a will, living trust or estate plan, the If You Died Guide is a comprehensive document that will give your loved ones, near and far, a vital resource in their time of grief. From financial and legal details to your medical and household information, the guide will provide your children, spouse, partner, significant other or caregivers with the essential details they'll need to make informed decisions should you suddenly pass on or become incapacitated. What's more, you can turn to the If You Died Guide as a definitive all-in-one reference to access your important information any time while you're very much alive. Whether you are in your retirement years, or even if you are young and just starting out, you can use it to list all of your insurance information, make a household budget, calculate your net worth, provide a Pets section for your house sitter - the list goes on and on. With 100 pages of detail, the If You Died Guide goes beyond the content included in wills and living wills, powers of attorney, and health care surrogate documents, to help you cover key information that would otherwise escape your attention. Your attention to personal matters NOW will provide an ease of transition should something happen to you and will alleviate unnecessary stress your love ones would have experienced had you not provided them with the If You Died Guide. Simple to fill out and easy to add to over time, the If You Died Guide is available in fillable PDF format, electronic flash drive, printed notebook, or any combination of the three, with free shipping on every purchase. We've created it as the ultimate all-in-one reference. Your family will find it a peace-of-mind record of the life you've lived ... and one lasting act of love to ease their way forward. Click here to see some sample pages from the If You Died Guide.